Wild animal attacks are not unusual, even in city or suburban living. Dogs are very inquisitive, and Shar-Pei is natural hunters who will most likely attack the wild animal first. Wild animals such as the skunk, the opossum or the raccoon have little chance of escaping from a Shar-Pei, but can inflict nasty bites. They can also be carriers of rabies. Do not neglect your dog’s immunizations against this dreaded disease. If a skunk sprays your dog, it can be very painful to his eyes, the area that seems to be just where the skunk takes aim. Wash your dog’s eyes with warm water, and apply a few drops of vegetable or olive oil to them. 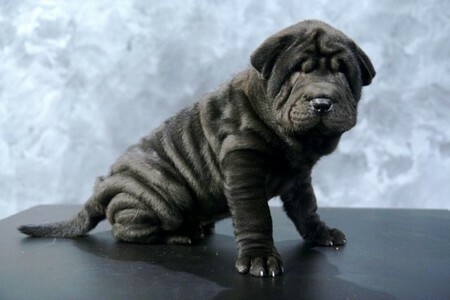 If you have any ophthalmic ointment on hand (which many Shar-Pei owners do), that will also suffice to ease the pain to his eyes. The usual treatment for the overpowering skunk odor is a bath in tomato or lemon juice, which can be followed by soap and water. When planning an outing in the country with your dog, take a few precautionary measures and a small first-aid kit,if not for you, for your dog. Include a small cloth muzzle, small knife, eye ointment, pliers, an antiseptic such as peroxide, meat tenderizer(for insect stings) and, should you anticipate meeting a porcupine, a small bottle of vinegar. If you are going into a part of the country where you know there are poisonous snakes, take along a snakebite kit. If your Shar-Pei accompanies you on a trip to the country where he might encounter a porcupine, it is helpful to know what to do if your dog once again decides he is a mighty hunter. With the porcupine, I think your dog will lose the fight If this happens, take your Shar-Pei to a veterinarian right away because porcupine quills will invade the tissues more and more as the dog moves around. If you are far away from a vet, you will have to remove the quills yourself as soon as possible. This should be done gradually and will be very painful for your dog and may necessitate using a muzzle. If one is not available, use a torn strip of fabric to tie his muzzle, twist it under the chin then behind the head and tie again. Beginning in the chest area, cut off the tips of the quills at an angle in order to release pressure, making them easier to remove (vinegar may also be used to soften the quills). Use an instrument such as pliers (if none are available, your fingers will have to do) to slowly twist out each quill¡ªdo not jerk them out As they are removed, clean the wound with an antibacterial agent such as peroxide. Snakebite is always a danger when hiking with your dog in the woods. Try to determine in one of two ways whether the snake is poisonous or nonpoisonous. Either kill the snake and examine its mouth (if the snake has two fangs that can be folded against the roof of the mouth, then it is poisonous), or if the snake cannot be found, examine your dog’s wound (if the snakebite consists of two puncture wounds as opposed to a row of teeth marks, then it was made by a poisonous snake). Some poisonous snakes are more deadly than others, but if you determine that the snake is poisonous, do not delay getting your dog to a veterinarian. If the bite is on the leg, a tourniquet applied between the wound and the body will help delay the poison moving to other parts of the body, but most snakebites on the dog are in the head region and this is even more dangerous. Trying to cut into the puncture wounds will help little and may waste valuable time. Try to keep your dog calm and find a veterinarian immediately.